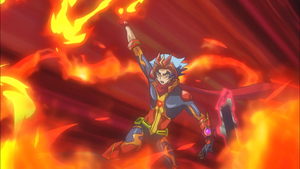 "Duelist Clad in Flames" is the forty-ninth episode of the Yu-Gi-Oh! VRAINS anime. It first aired in Japan on April 25, 2018. As Playmaker chases after Bohman, the Duelist who stole Jin's consciousness, two Duelists appear before him and block his path. However, a mysterious Duelist called Soulburner then shows up to help Playmaker. And what's more... Soulburner also has an Ignis in his Duel Disk! BitBoot Normal Summons "D-Scale Sabre Sardine" (600/100). BitBoot activates the effect of "Sabre Sardine", paying 500 LP to Special Summon a "D-Scale Token" (?? ?/100) in Defense Position (BitBoot: 4000 → 3500 LP). BitBoot uses the "D-Scale Token" and "Sabre Sardine" to Link Summon "D-Scale Battle Coela" (1800/LINK/2/←↓) to the Extra Monster Zone. BitBoot activates the Equip Spell Card "D-Scale Torpedo", equipping it to "Battle Coela". BitBoot activates the effect of "Battle Coela" to move it to a Main Monster Zone it points to. He moves it to the zone its bottom-center Link Arrow pointed to. As his LP is 4000 or lower, Bit activates his Skill "Marker's Portal", to activate a Link Spell Card from his Deck. That Link Spell Card cannot be negated or destroyed by Soulburner's card effects. He activates "Judgment Arrows" (↖↑↗) at the Spell & Trap Zone the bottom-center Link Arrow of "Battle Coela" points to. If a Link Monster it points to battles, the effect of "Judgment Arrows" doubles its ATK during damage calculation. If "Judgment Arrows" leaves the field, all monsters it points to are destroyed. BitBoot activates the other effect of "Battle Coela" to move it to a Main Monster Zone a card linked to "Battle Coela" points to. He moves "Battle Coela" to the zone the top-left Link Arrow of "Judgment Arrows" points to. BitBoot activate the effect of "Torpedo" to inflict 800 damage to Soulburner for every time the equipped monster moved this turn, in this case two (Soulburner: 4000 → 2400 LP). Soulburner draws "Cybersal Cyclone" and Sets a card. Soulburner activates the effect of "Salamangreat Meer" in his hand, sending a "Salamangreat" monster from his hand to the GY to Special Summon it (800/600). He sends "Salamangreat Foxy". As there is a face-up Spell/Trap Card on the field, Soulburner activates the effect of "Foxy" in his GY, sending a "Salamangreat" monster from his hand to the GY to Special Summon it (1000/1700) and destroy a Spell/Trap Card on the field. He discards "Salamangreat Falco" and targets "Judgment Arrows", but as "Judgment Arrows" was activated using "Marker's Portal", it cannot be destroyed by card effects. Soulburner activates the effect of "Falco" in his GY, returning a "Salamangreat" monster to his hand to Special Summon it (1200/1600). He returns "Meer". As "Meer" was added to Soulburner's hand other than his normal draw, Soulburner activates its effect, Special Summoning it (800/600). Soulburner uses "Falco", "Foxy", and "Meer" to Link Summon "Salamangreat Heatleo" (2300/↙↑↘) to the Extra Monster Zone. As "Heatleo" was Link Summoned, Soulburner activates its effect to shuffle a card in BitBoot's Spell/Trap Zone into their Deck. He shuffles "Judgment Arrows". As "Judgment Arrows" left the field, all monsters it points to are destroyed. "Heatleo" attacks BitBoot directly (BitBoot: 3500 → 1200 LP). BitBoot draws "D-Scale Piercing Saury" and Normal Summons it (800/600). BitBoot activates the effect of "Piercing Saury", sending a "D-Scale" monster to the GY to Special Summon a "D-Scale" monster from the GY with its ATK halved. He Special Summons "Battle Coela" (1800/←↓). As his LP is 4000 or lower, Boot activates his Skill "Marker's Portal", to activate "Judgment Arrows" (↖↑↗) at the Spell & Trap Zone the bottom-center Link Arrow of "Battle Coela" points to. BitBoot uses "Piercing Saury" and the Link-2 "Battle Coela" to Link Summon "D-Scale Fullmetal Dunkle" (2400/←↓→) to a zone the top-center Link Arrow of "Judgment Arrows" points to. BitBoot Sets a card. "Fullmetal Dunkle" attacks "Heatleo". As a Link Monster it points to battled, the effect of "Judgment Arrows" doubles its ATK during damage calculation ("Fullmetal Dunkle": 2400 → 4800 ATK). As BitBoot's monster declared an attack, Soulburner activates his face-down Trap Card "Energy of Fire" to shuffle a "Salamangreat" monster in his GY to his Deck, gain LP equal to its ATK, and prevent monsters from being destroyed by that battle. He shuffles "Falco" (Soulburner: 2400 → 3600 LP) and targets "Heatleo". The attack continues and "Heatleo" is not destroyed (Soulburner: 3600 → 1100 LP). Soulburner draws "Monster Reincarnation". As BitBoot controls a "D-Scale" Link Monster with a Link Rating equal to the combined number of cards in Soulburner's hand and monsters he controls, they activate their face-down Trap Card "D-Scale Chaff" to negate the effects of those cards and prevent Soulburner's monsters from attacking until the end of this turn. Soulburner activates his Skill "Burning Draw", to lower his LP to 100 and draw a card for every 1000 LP lost (Soulburner: 1100 → 100 LP), in this case one. He draws and activates the Field Spell Card "Salamangreat Sanctuary". When Soulburner Link Summons a "Salamangreat" Link Monster, the effect of "Salamangreat Sanctuary" allows him to use a monster with the same name as Link Material instead. Soulburner uses "Heatleo" to Reincarnation Link Summon another "Heatleo" to the Extra Monster Zone. As "Heatleo" was Link Summoned, Soulburner activates its effect to shuffle "Judgment Arrows" into BitBoot's Deck. As "Judgment Arrows" left the field, all monsters it points to are destroyed, but the effect of "Fullmetal Dunkle" prevents it from being destroyed once per turn, then, as the first effect of "Fullmetal Dunkle" was used, BitBoot activates the second effect of "Fullmetal Dunkle" to move it to a Main Monster Zone it points to. He moves it to the zone its middle-left Link Arrow pointed to, then, as "Fullmetal Dunkle" was moved, BitBoot activate its effect to target a monster in the same column as "Fullmetal Dunkle" and destroy it during the End Phase. As "Heatleo" was Reincarnation Link Summoned this turn, Soulburner activates its effect to change an opponent's monster's ATK to that of a monster in his GY. He makes the ATK of "Fullmetal Dunkle" the same as "Meer" in his GY ("Fullmetal Dunkle": 2400 → 800 ATK). "Heatleo" attacks and destroys "Fullmetal Dunkle" (BitBoot: 1200 → 0 LP). This page was last edited on 31 January 2019, at 19:57.